A hammer drill is your go-to tool when it comes to drilling through concrete, bricks, stones, and wood. The special design of a hammer drill makes it more portable, controllable and manoeuvrable compared to a normal-sized standard, regular drill. The preference for hammer drills is further informed by the fact that they provide a lot of power, are quick, efficient and very accurate. 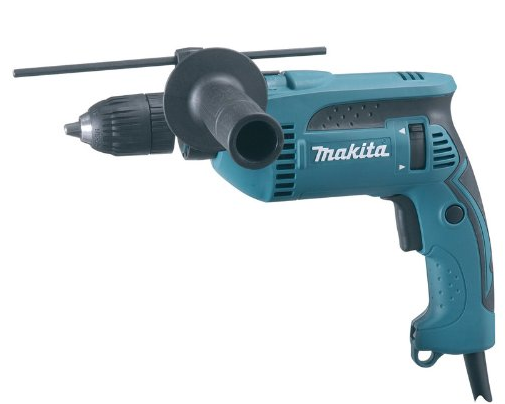 The Makita XPH012 is one of the best performing hammer drill available in the market today. The hammer drill has a total length of just 8 1/8-inches with a lightweight construction weighing just 4 pounds. The manufacturers put a lot of thought into making it as portable as possible. 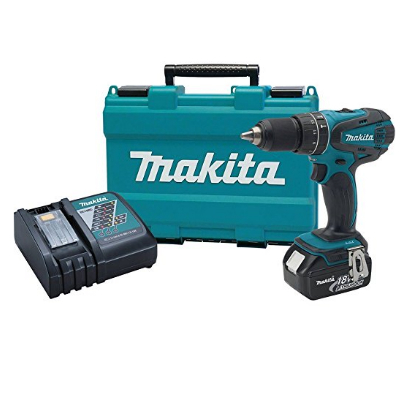 To drill Kit portable, they eliminated the need for a cord by making the Makita Cordless Hammer Drill battery-operated, running on slow-discharging lithium-ion batteries. The use of slow-discharging lithium-ion batteries means that you have additional minutes, possibly hours to continue working on your project before the battery completely runs out. Furthermore, the drill has an ergonomic and very compact design making it the best choice for accessing harder to reach locations. 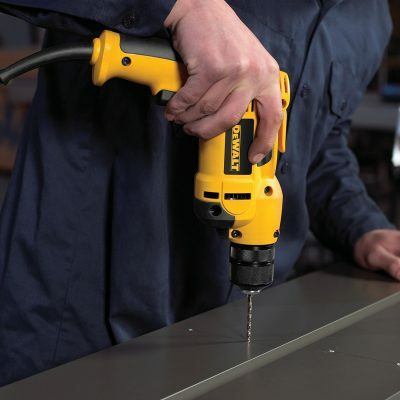 As a top performer, the battery-operated drill has adequate power to enable it to achieve variable speeds of between 0 and 1,500 rotations per minute. In the process, its 4-pole motor effortlessly attains a maximum torque of approximately 480-inch pounds. Given that the drill has such impressive specs, it is ideal for a wide range of operations that include driving, drilling, as well as hammer drilling. Since the hammer drill doubles up as a driver, it will not only ease your work but also significantly increase your productivity and convenience. Being a complete kit, the XPH012 delivery package arrives a case, the hammer drill itself, and a spare battery to get you started on your operations. The batteries supply adequate power to enable the drill to run at its full 18-volts. While the battery is slow-discharging, the hammer has a rapid optimum charging that considerably reduces the duration it takes to charge to full capacity. Consequently, you will be spending the least amount of time possible between the times the battery runs out to the time it gains full charge. You will, therefore, be saving a lot of time in-between. Couple this with the illuminating LED light and you are sure to be working until late in the night even under poor lighting conditions. The ability to instantly change between drilling and driving makes thedrill one of the most versatile and productive hammer drills out there. It also features a 1/2 –inch drilling capability and the ability to deliver between 0 and 6,000 blows per minute and 0 to 22,500 blows per minute using an adjustable speeds feature. Consequently, breaking through concrete and other materials will literally feel like cutting through a piece of cake with a hot knife. The DEWALT DWD112 is definitely the best hammer drill in the market today. A quick check at Amazon.com, for instance, reveals that the hammer drill has more than 400 positive buyer reviews under its belt and currently enjoys an impressive 92 percent satisfaction rating. The drill has one the most powerful motors in the market. The 8-amp motor is capable of generating speeds of 2,500 rotations per minute. 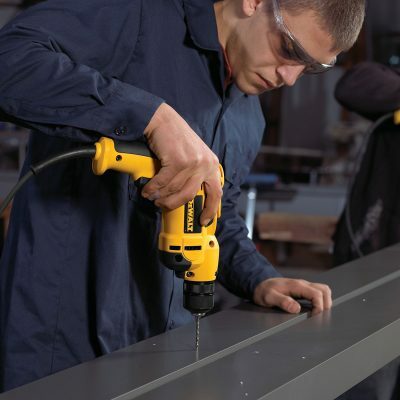 The inclusion of a variable speed trigger makes the DeWalt an ideal tool for a majority of industrial and heavy-duty projects. The variable speed feature is perfect for giving the hammer drill a slow start when you are starting on a new hole, more so when there is a need for precision and accuracy. It is also quite safe to use. The inclusion of an all-metal keyless chuck means that there is no possibility of the hammer drill’s bits and parts coming off as you work, irrespective of the density and toughness of the drilling material. Holding and using the hammer drill is relatively easy considering that its approximate weight is just 4.1 pounds. The handle has an ergonomic design and comes with a soft grip aimed at preventing the user from experiencing any fatigue while working on demanding and protracted applications. The VSR capability of the variable speed trigger enables you to adjust the speed depending on the nature of your drilling material. Hence, the hammer drill is sure to last for a long time. 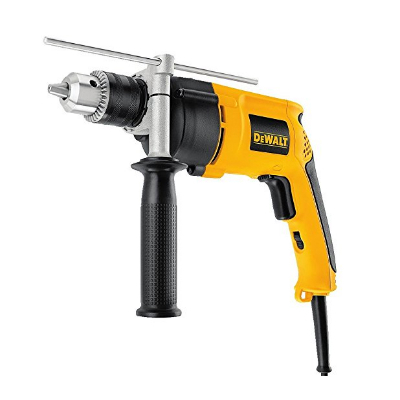 Couple that with the fact that the DeWalt Pistol-Grip Drill has a robust and sturdy all-ball bearing construction capable of considerably prolonging its shelf life. You now have a tool that with proper use, you can pass on to your children. To top it all off, this hammer drill comes with a 3-year limited warranty and 90-day money back guarantee. Additionally, within the first year of purchase, you will enjoy a free service contract. The choice of Dewalt DW511 is informed by its versatility, controllability, and comfortability. It is a multipurpose tool that you can put to drilling and hammer drilling uses. The DW511 Hammer is ideal for use on a variety of material such as concrete, steel, stone and even wood. The hammer drill additionally packs an overload protection to safeguard the motor against the devastating consequences of overheating in cases where the motor is overloaded. Consequently, you are sure that your motor will continue working for the next several years without requiring replacement or even constant repairs. This not only saves you money but also the time you would otherwise spend between your workstation and the nearest repair shop. The hammer drills come with adjustable variable speed trigger. The implication of this is that you have the ability to precisely place a hole whenever you need it. When dealing with tougher materials such as stones, concretes, or even steel, you also have the freedom of user higher speeds to smoothly get the job done. You will, therefore, be able to vary your speeds in accordance with the density of the materials you are drilling through. 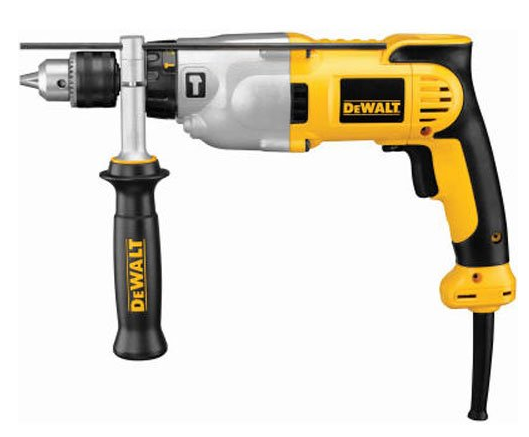 The DeWaltdrill has a light and compact design that weighs just 4.3 pounds. With this small weight in your hands, you can work continuously for hours on end without ever experiencing any significant fatigue on your arms and upper joints. Moreover, you will use considerably less downforce to hammer through dense materials because of the design of the motor. You will be able to complete your projects and applications much faster as you will experience substantially less fatigue. The drill is even more controllable and easier to use with the inclusion of a side handle. The side handle gives you the ability to balance the weight of the hammer drill on both hands while drilling. With this feature, you will be more accurate and have more control over your preferred depth. Since it is also possible to rotate the side angle through 360-degrees, you will have the ability to change its position to suit your working angle without necessarily changing your position. Another significant feature of the drill is the integrated depth rod that enables you to take precise depth measures. The hammer drill operates on a 7.8-amp motor and a maximum power output of 650 watts, which is quite impressive as it rivals that of more expensive models. It has a Max drilling capacities for steel, concrete, and wood are 1/2, 5/32, and 1 1/4 –inches, respectively. In spite of the numerous pros of the DW511, it has one minor flaw. Setting up the chuck key connecting to the hammer drill is a little cumbersome. The SKIL 6445-02 drill is specifically aimed at the price-conscious user with an eye for versatility, performance, and durability. It comes with a powerful motor with a fully functional variable speed trigger as well as an on/off hammer mechanism. Simply squeezing and releasing the trigger will turn the hammer drill on and off. Since the drill has an ergonomic design, the handle is comfortable to hold with its rubberized grip. You will experience relative comfort with this hammer drill even after long hours of drilling. For convenience and in an attempt to make the hammer drill more productive, there is a chuck key storage clip included at the base of the handle grip. Chances of losing or misplacing the chuck key are therefore substantially less likely. 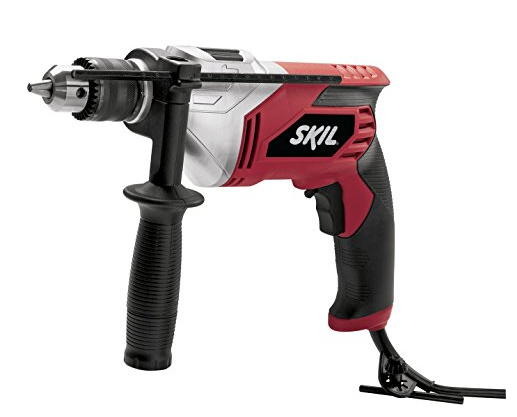 Reversing the rotation of the SKIL drill is stress-free with the inclusion of a reverse lever. This comes in handy in case the hammer drill becomes stuck in a drilling material. The reverse rotation lever is conveniently placed right above the trigger switch, and after setting it up appropriately, you can gently press the trigger to carefully get the hammer drill out. It is worth noting that the variable speed feature also works when you reverse the rotation of the chuck. The speed of the chuck varies in response to the pressure with which you squeeze the trigger. The variable speed feature is even more important as it significantly reduces the possibility of the hammer drill to wander while you start a new hole. You can simply use the Lock-On Switch to maintain a specific speed for as long as you want without having to squeeze the trigger continuously. Resetting the feature requires you to simply and hastily squeeze the trigger once. The drill has a powerful 7-amp motor capable of delivering rotations per minute of up to 3,000 with no load. The fact that this hammer drill can produce a maximum of 51,000 blows per minute further reinforces its versatility and superior performance. Nevertheless, it is not ideal for drilling or hammering through tougher materials such as concrete. Since it has a keyed chuck, changing the bits and parts of this hammer drill will not be as convenient as is the case with some of its closest rivals. It has a maximum capacity of 1-inch for concrete and 1 5/8-inches for wood. The SKIL comes with an auxiliary handle whose aim is to have more stability. It has a 360-degree rotational mechanism meaning you can use with either the right or left hand. The depth gauge gives the ability to set the depth you desire and keep an eye on the progress. The DeWalt brand is synonymous with producing very durable and versatile tools, as is clearly demonstrated by the DEWALT DWD520K drill. The hammer drill doubles up both as an ordinary drilling and a hammer drilling tool. It comes with a selector that enables you to change between these two functions. Whenever there is a need for additional power, you can switch to the hammer-drilling mode in which it can deliver an amazing 56,000 blows per minute. Very few hammer drillers, if any, can offer more than 50,000 blows per minute. The drill packs a powerful 10-amp motor. According to DeWalt, the design of the motor makes it capable of generating an additional 50 percent of power. 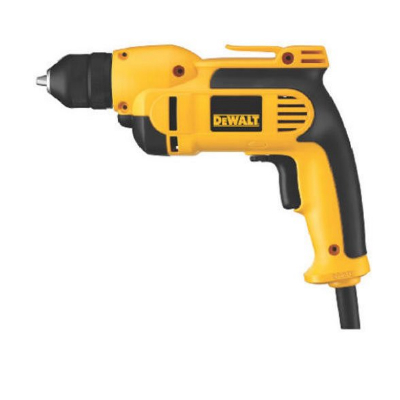 The hammer drill produces a maximum of 980 watts. It is even a more versatile hammer drill considering that it has a two-speed gear offering between 0 and 1,200 rotations per minute and between 0 and 3,500 rotations per minute. Consequently, you have the freedom to work on projects requiring both high-speed drilling and extra torque. It is, however, worth noting that the 2-speed feature is only applicable to ordinary drilling and not hammer drilling. You can adjust the speeds to suit your needs with the variable speed trigger. You will be able to start out slowly and smoothly and shift into higher speeds in case you need extra power to get through tough materials. Lower speeds are highly recommended when making holes or when dealing with materials that are delicate such as ceramics. The location of the reversing switch conveniently on top of the trigger switch makes it easy to push it either to the left or the right. Pushing the reversing to the left gets the drill operating in reverse while pushing it to the right does the exact opposite. The DWD520K has additional features that aim to increase the convenience of the user. There is a locking side handle that is adjustable to a full 360-degree, thereby significantly increasing your accuracy while giving you additional control. Since it can rotate 360-degree, you can operate it with either hand and lessen the possibility of suffering a personal injury. The hammer drill obviously comes with a chuck key with a holder and the depth rod that monitors the depth of your drills. All these additions and features bring the total weight of the hammer drill to 6 pounds, which compared to other hammer drills, can be considered relatively heavy. The capacity for drilling steel and wood is 1/2-inch and 1 1/2-inch, respectively. With concrete, the capacity falls between 5/32 and 7/16-inches. If you are looking for a hammer drill with a reputation for versatility and performance, look no further than the Milwaukee 2607-20. This hammer is also one of the most user-friendly hammer drills in the market currently. It not only comes with a drilling capacity of 1/2 –inches but is furthermore equipped with a variable speed trigger. You will be able to control the speed of this hammer drill to match your needs and the materials you are driving or drilling. For light drilling, the recommendation is that you stick to lower speeds to increase the shelf life of the motor and to preserve power. Tougher materials, on the other hand, would necessitate the use of higher speeds. The drill runs at 18-volts of power and weighs just 3.4 pounds. Since it is a battery-powered hammer drill, you will need to purchase a lithium-ion battery separately. Even after including the battery, the weight of drill does not increase beyond comfortable levels. You will still be able to use the hammer drill on for a prolonged period before you begin to experience any exhaustion. Furthermore, the power supplied by the lithium-ion battery is more than adequate to allow you to drive or drill through materials of different densities. The tool smoothly drills through concrete, blocks of stones or bricks, metal and wood. 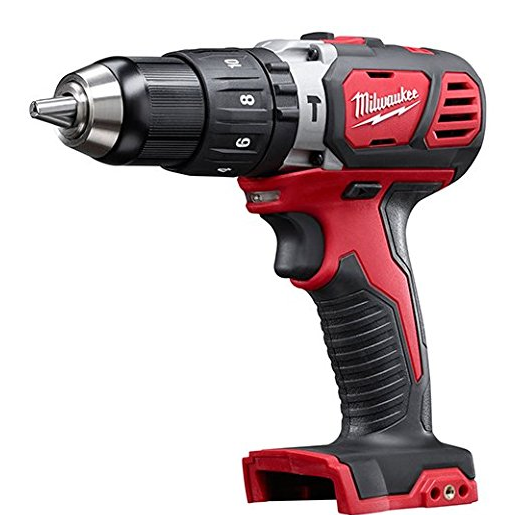 The immense power that comes with the Milwaukee means that it is ideal for both domestic DIY projects and medium-density industrial applications. Nevertheless, in case your project involves thick concrete, we highly recommend that you proceed with a lot of caution. The hammer drill boasts of some 500 lbs of torque and is capable of producing a maximum of 1,800 rotations per minute. With this amount of power in your hands, you will hardly encounter any real resistance, especially for DIY applications. The entire casing of the drill is metallic and has red and black outer painting. It also has one sleeve ratcheting chuck that measures 1/2 –inch in length and is also all-metal. The hammer drill incorporates the REDLINK Intelligence that guards against the possibility of overheating following long hours of use on more intense projects. Considering that the Milwaukee 2607-20 M18 1/2″ Hammer Drill is a light and compact tool, it fits perfectly into your hands. Its portability, given the lack of a cord, makes it ideal for reaching spaces that otherwise would be quite challenging to access. Like most worthwhile hammer drills, the Milwaukee Hammer Drill has an inbuilt LED light that does a wonderful job illuminating your workstation in case of poor lighting conditions. Being a bare tool, though, the delivery package does not come with a charger nor a battery. The Ryobi cordless drill is the perfect hammer drill for those looking to perform light to medium-duty Do-It-Yourself applications within the house. It should be your first and only resort when performing less demanding home improvement works as it can function as a conventional drill driver. When dealing with concrete or even tougher materials, you are going to be in need of additional drilling power. This is where the hammer drill comes in handy. It is capable of producing a maximum of 600 in./lbs of torque. To make drilling through concrete seem even more effortless, the Ryobi can also attain ample speeds of 1,500 rotations per minutes and 19,500 blows per minute. Honestly, the powerful motor and the accompanying speeds may make you indifferent to the density of different drilling materials. The hammer drill incorporates a 24-position clutch, giving you additional control to smoothly switch from drilling to driving, as the need arises. Thedrill is quite convenient to use as it comes with a bunch of other features aimed at easing and speeding up the time you will take to finish your Do-It-Yourself tasks. Its single sleeve chuck, for instance, is made entirely out of metal. Other than being durable, the chuck is also key-less thereby allowing you to effortlessly change the bits of the drill. It is a bare tool only meaning that you will need to purchase a lithium-ion battery and a charger separately. 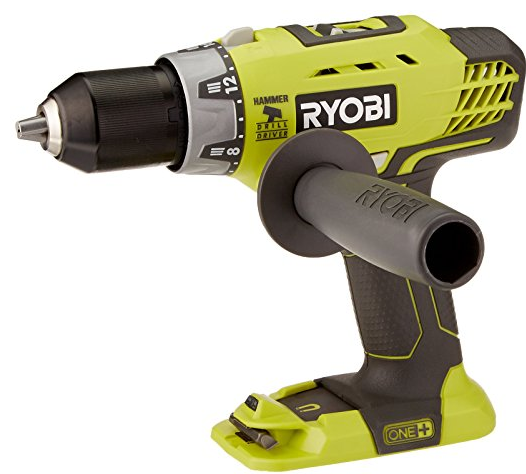 Nevertheless, it is compatible with both Ni-cad and lithium-ion batteries, as is the case with nearly all Ryobi tools. The fact that the tool is cordless has the advantage that it has increased portability and can be used both inside and outside the house. Pair that with the ergonomically designed and comfort GRIPZONE handles and will encounter no difficulties whatsoever reaching confined spaces. A built-in bubble level will accurately inform on the status of the battery. The hammer drill comes with an MAGTRAY magnetic holder that conveniently enables you to keep all the bits in one specific place. The Bosch 1191VSRK comes to an assortment of very attractive features. The hammer drill is more suitable for first-time owners and is also perfect for less-demanding Do It Yourself projects. Beyond its durability and lightweight construction, this hammer drill has immense potential and is quite capable of delivering the power needed to complete any light-duty application. It comes with a 7-amp motor operating at 120-volts and with the ability to provide 3,000 rotations per minute. As if that is not enough, the hammer drill can drill at 48,000 blows per minute. Basically, the hammer drill does not hesitate even for a minute when drilling through steel or hardwood. However, the Bosch Hammer drill is not ideal for heavy-duty drilling work or for drilling through tough materials such as concrete. Working with these materials can considerably reduce the shelf life of the tool. In addition to its sturdy and compact construction, the drill also features a variable speed trigger. The reversing switch comes in handy when you have to remove parts of the hammer drill or in the inevitable case when it is stuck. Like all hammer drills worth their value, the Bosch hammer drill offers a 2-mode operation. The feature ensures that doubles up as a rotary drill and a hammer drill for convenience. The latter mode provides additional power to drill through materials of varying densities. To shift between the two functions, you will only need to use a single switch. 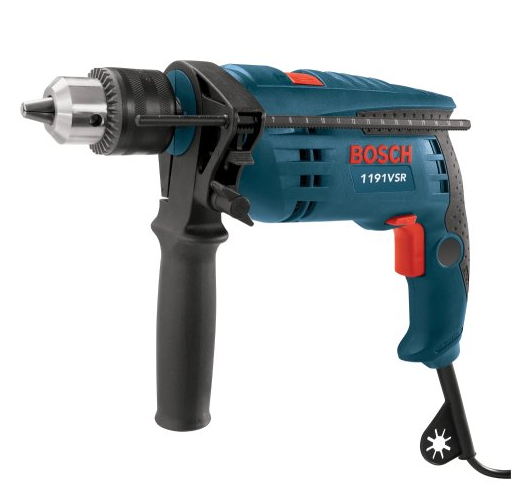 The grip handle has an ergonomic construction that significantly increases comfort when using the Bosch Hammer Drill. Since the handle is easy to shift to several positions, you will be able to shift your grip in accordance with your drilling position without necessarily moving about. The side handle on the hammer drill has the capability of 360-degree rotation and incorporates a built-in depth gauge that monitors the depth of you driving and hammering. These features make grinding more accurate and accord you more control and accuracy when finishing your project. The delivery package comes with the hammer drill itself, a secondary handle, depth rod, chuck key and a carrying case to keep them all in. 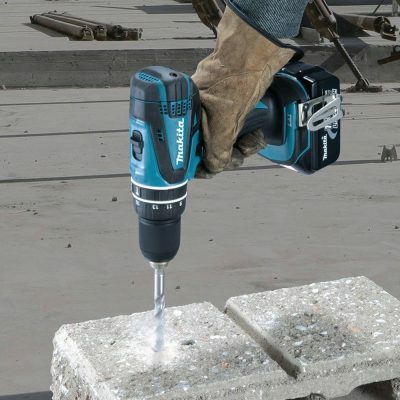 The Makita brand once more lives up to its reputation with the HP1641K drill. The hammer drill is a perfect embodiment of power, performance, convenience, and speed, all rolled into one. Other than being a long-lasting and top performer, the drill packs a lot of power seeing as it has a powerful 6-amp motor that delivers precisely 2,800 rotations per minute and another 44,800 blows per minute. With such astounding specs, you would expect the Makita to be heavy and lack the manoeuvrability of its competition. Nevertheless, the hammer drill has a light and compact design, with its weight coming in at just 4.3 pounds. The weight and its compact design make the HP1641K an ideal hammer drill for even the hardest Do-It-Yourself projects within or outside the house. The Makita HP1641K has a 2-mode operation system. The implication of this is that you can either use the hammer drill for rotation purposes or shift to “hammering with rotation” mode when you are in need of additional drilling power. The hammer has a drilling capacity of 5/8-inches for tough materials such as concrete. Furthermore, the entire hammer drill features an all-ball bearing build. Couple this with the long-lasting motor branches and you have a tool that you will be using for the numerous years. These features will also enable to have a smooth and reliable experience working with the HP1641K hammer drill. It has an ergonomic construction that is typical of all hammer drills with such specs. The grip handle of the hammer drill is soft to make operating the hammer a comfortable experience. Unlike most of its rivals in the market, the hammer comes with a side handle that makes it possible and easy to balance the weight of the hammer drill in both hands. Consequently, you will not have to compromise on comfortability and controllability when you have to access tight spaces or when in need of additional power to drill through tougher materials. The design of the drill aims at keeping you safe and increase convenience when drilling. To this end, the hammer drill has a recessed lock-on button whose function is ensuring you continue drilling for an extended duration without becoming fatigued. You will be able to use the depth gauge to track how deep you are drilling. Changing parts and bits of the hammer drill is even easier with the key-less chuck. The delivery package includes a carrying case hence eliminating the need to purchase a carrying bag. The XPH07T features an excellent ergonomic design. It has a weight of 5.9 pounds that falls between heavy and compact lightweight. The heavyweight is most likely due to the use of an all-metal gearing and gear housing. The all-metal gearing makes the hammer drill one of the most durable hammer drills out there capable of withstanding even the harshest drilling and driving conditions you can subject it to. Picking up and operating the hammer drill is gives you a comfortable feeling as it fits with near perfection in the hands. The grip has a rubber over moulding finish which augments the levels of comfort and reduces fatigue when using the hammer drill. Being a bare tool only, you will need to purchase lithium-ion batteries separately. It takes just a few seconds to install the 5.0-amp battery, and because they are slow discharging, you can increase your usage by wisely choosing the speeds that are commensurate with the load you will be handling. It conveniently features a LED work-light that helps you keep track of the remaining charge. Furthermore, when the batteries are completely drained out, it takes an average of 45 minutes for them to charge fully. You will be back to drilling in no time at all. It offers quite a smooth operation. Without even installing the side handle, the vibrations are conspicuously less. It is in a class of its own with the 1,090-inch pounds of torque it offers. The all-metal 2-speed gear of the hammer drill is capable of taking it to speeds of between 0 and 550 rotations a minute, and 0 and 2,100 rotations per minute. 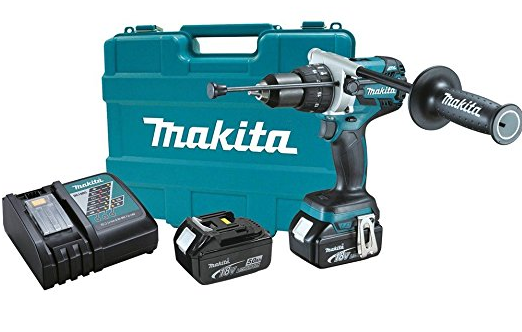 Add that to the fact that it also has a blow per minute of 31,500 and you have a very versatile and top-performing hammer drill suited for both industrial and domestic projects. It has varying capacities of 1/2-inches, 5/8-inches, and 3-inches for steel, stone, and wood, respectively. Brushless motor helps with the efficient and smooth running of the hammer drill. Hammer drills have additional features aiming at making them more convenient to use. The inclusion of over-moulding layer plays a remarkable role in reducing the effects of the vibrations on the hands and arms. This also helps with fatigue and accuracy. The inclusion of a keyed chuck increases usability as it firmly holds the bits and parts of the hammer drill in place thereby preventing slippage. Top performing hammer drills come with a variable speed feature allowing you a slow start when drilling a hole. The feature increases your precision at the beginning of drilling. Tougher materials will require higher speeds hence the need to squeeze the trigger harder to drill through them. To achieve a good performance, you will need to get a hammer drill offering around 7-amps of power. Hammer drills vary in their drilling capacities. A majority of them come with a drilling capacity of 1/2 –inches. You will need to base your choice of the most appropriate hammer drill on the project you are looking to use it on. For projects involving tougher concrete, we recommend you select one with superior drilling capabilities. Hammer drills are either corded or battery-powered. Battery-powered ones have the advantage of portability. You can use them within or outside the house. Nevertheless, corded hammer drills are more powerful making them more ideal when dealing with very hard materials such as concrete. You need to base your choice on these factors before making a decision. Q: How different is a hammer drill from a regular drill? A: A regular drill is intended for more general applications such as to make holes on wood and to take parts of a metal apart. In other cases, professionals use them to drive screws in or out. A hammer drill, on the other hand, comes with a lot of efficiency and power which is perfect for drilling through tougher materials such as concrete, bricks, and stones. Furthermore, a hammer drill combines the functions of a regular drive with that of a driver. Q: Given that concrete is tough, how should I use a hammer drill on it? A: Before tackling any concrete material, determine whether the specs of your hammer drill can match such tough conditions. Does it have adequate amperage and correspondingly high blows per minute? Additionally, compare your tool against other top-rated ones in the market to see if it can handle concrete. Nevertheless, we highly recommend that you take precautionary measuring when drilling through concrete. Your drilling should be clear of debris at all times. Over-drilling can adversely affect the durability of your hammer drill. Hence, ensure you are applying an amount of pressure commensurate with your drilling so as to prevent the hammer drill from breaking into bits. Wear face protection goggles, gloves, body-covering clothing, work boots and the like whenever you are handling a hammer drill. Hammer drills are a necessary tool whenever there is a need to drill through stones, bricks, concrete, or even wood. They are even more ideal for drilling bigger holes. Their durability largely depends on the owner’s use, the brand, and the finishing. Nevertheless, a majority are capable of withstanding tough conditions. The pricing of the hammer drills is quite reasonable as they are handy tools when it comes to home improvement, renovations, and remodeling.